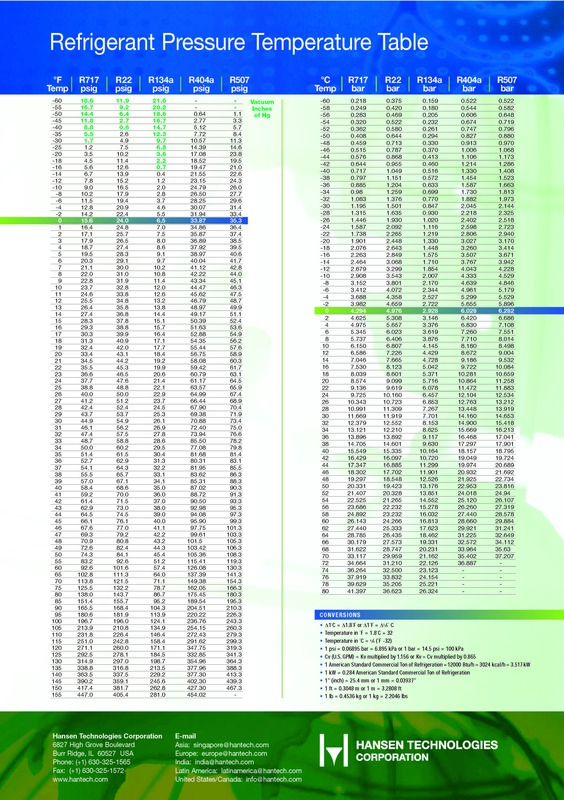 This page contains downloads with useful Energy Efficiency and Energy Engineering information. They’re all available for free, with the hope that they’ll contribute towards an advancement of Energy Engineering, and ultimately, increased energy savings. Access to good weather data is an invaluable tool in our field of work. We use it to find relationships between atmospheric conditions, operating profiles, and the resultant effect on energy usage, which in turn helps us identify opportunities for efficiency and quantify energy savings. Lucky for us, this data is recorded by the National Oceanographic and Atmospheric Association (NOAA) weather stations and made available to the public. After downloading thousands of these datasets, we’ve noticed that records can often require a little love and attention before getting put to good use. As such, we’ve developed a tool to help automate these processes. Although we feel confident in our tool, we encourage an additional quality check for each individual dataset. To make this easier, we’ve included a “QC Summary” located at the top of each report output that details the percentage of estimated data points and a description of how they were calculated. We’ve also noticed that the reliability of NOAA data is highest at the largest airports. With this in mind, we recommend considering using data from the nearest major airport, avoiding small municipal airports when possible. This download contains common unit conversions, formulas, and rules of thumb. 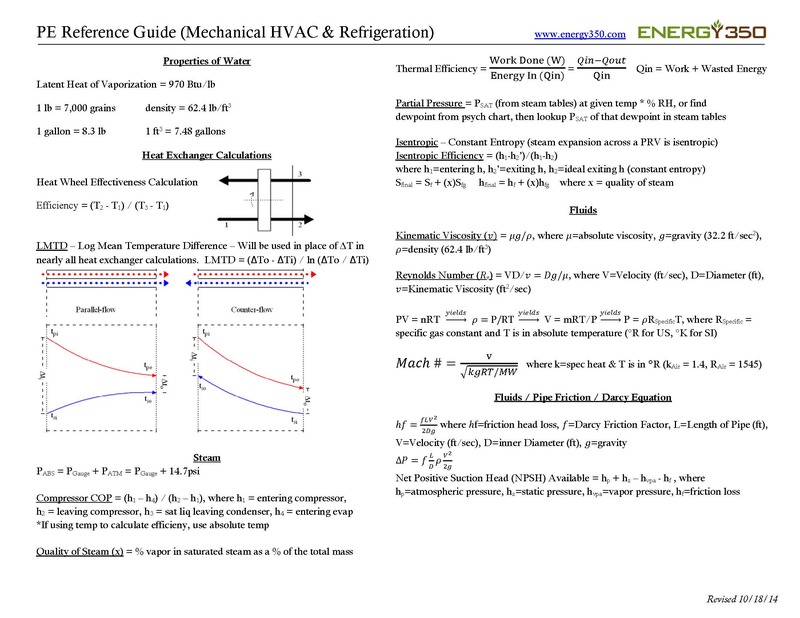 This download is a reference guide pertaining to mechanical HVAC and Refrigeration. It contains formulas for water properties, heat exchanger calculations, and steam, fluid, and friction formulas. 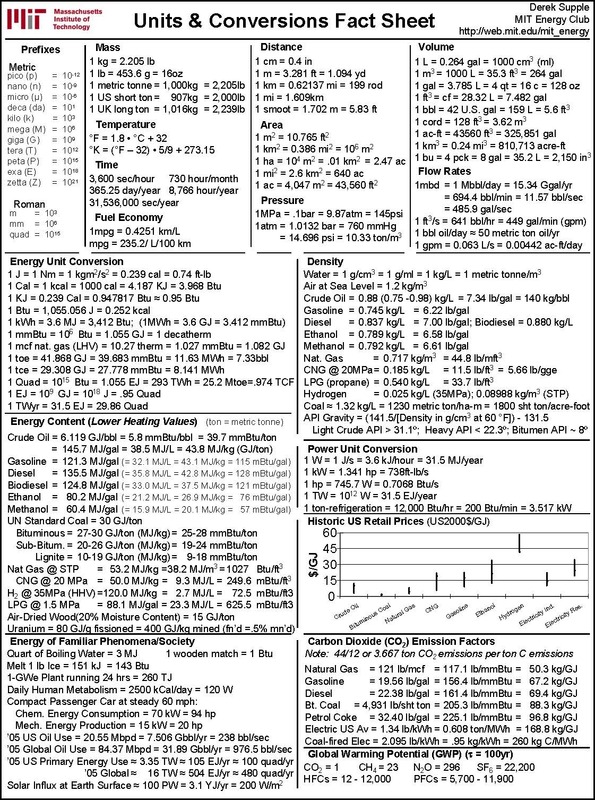 Units & Conversions fact sheet, released by MIT Energy Club. 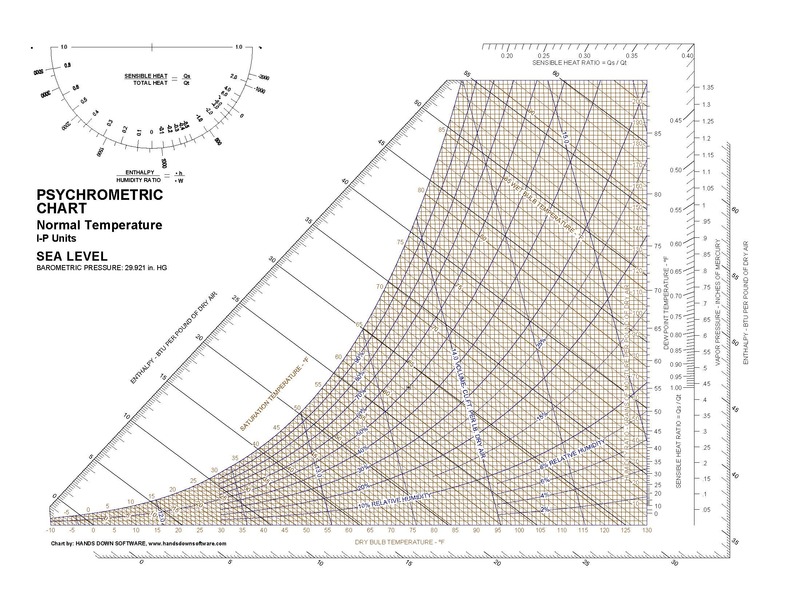 Graph measuring enthalpy (in BTU/pound of dry air) against dry bulb temperatures and dewpoint temperatures. It determines the resultant sensible heat ratio and relative humidity. Table measuring properties of saturated steam. It takes gauge pressure (PSIG) and gives resulting temperature, heat in BTUs per lb, and specific volume. This powerpoint was presented by Josh Weissert, and speaks to Energy 350’s role in opening up the RTU retrofit market. This presentation accompanies the Indoor Cannabis Growing paper, and was presented by Mike Christianson at the 2018 ACEEE Summer Study on Efficiency in Buildings. How to remove heat caused by dehumidification from the growing environment, which is typically dominated by the need to cool. How to mitigate challenges in balancing indoor environment plant needs, which are CO2 enriched and clean, with traditional efficient HVAC design, which relies upon free or efficient cooling in cool weather without introducing impure air into the growing space and exhausting unacceptable amounts of CO2. How to engage a historically unorthodox population of growers with little access to capital and even less time to consider efficiency. Pay for Performance Case Study: 3 Years of Performance, presented by Chris Smith at the 2018 ACEEE Summer Study. This paper explores the concept of Pay for Performance programmatically and technically, using 1000 Broadway as an example. Do Touch That Dial! How Satisfied Were You With That Tier II Power Strip? was presented by Nick O’Neil at the 2018 ACEEE Summer Study. What was the initial installation rate and persistence over time? What reasons were given for removing the device over the 2-month post-install period? How easy was the installation using the manufacturer provided instructions? How satisfied were customers overall with the power strip? Is there a relationship between customer demographics and persistence? Powerpoint presentation by Josh Weissert on Engaging Large Industrials: Beyond Capital Projects. This is the paper accompaniment to the presentation Engaging Large Industrial Customers. Using gateway projects to open doors. What are good gateway projects? Leveraging motivations to explore and implement energy conservation measures. Beyond the energy economics. What gets plants to commit? Tools to deploy while on your first site visit in a plant that is overwhelming. How to develop rapport with an industrial. What not to do. Using Retrocommissioning approaches to earn trust with data driven presentations and results. Why do programs meter in the first place? What is involved with metering and what are common barriers? What is the upfront and long-term value to metering? Paper accompaniment to presentation, More Value to Metering Than Every Before.